Added by Indo American News on November 26, 2014. MOU signing on November 18, at HCC Katy Campus. From left: Tejal Patel (HCC NW-PR), Aric Nitzberg (HCC Film Division Chair), Sita Mutyala (FIS), Rose Sarzoza Pena (HCC Spr. Br. 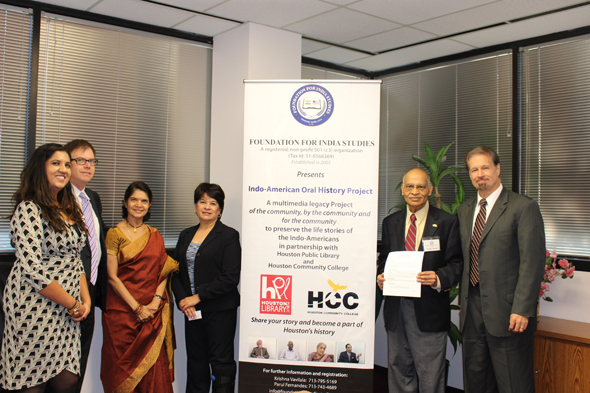 campus Manager), Krishna Vavilala (FIS), and Dr.Edmund B.
HOUSTON: Foundation for India Studies ( FIS) and Houston Community College System (HCC) have both signed a MOU at the Katy campus on November 18, to partner in FIS’s Indo-American Oral History Project. The MOU will facilitate HCC and FIS to collaboratively produce video recordings of oral history interviews of the first generation immigrants from India who came and settled in greater Houston area in the early 60’s,70’s and 80’s and have contributed to Houston’s economy and cultural diversity. The video interviews will be transcribed and permanently stored in the digital archives of the Houston Public Library (HPL) under a separate agreement reached with HPL earlier. The video recordings will not only benefit academia like the historians,researchers, sociologists and students, but also will enable future generations of Indo-American children to trace back to their roots in India. From left: Aric Nitzberg, Film making Divsion Chair, Krishna Vavilala (FIS) and Dr. Edmund Butch Herod, Acting President HCC NW. Under this MOU, HCC will make available their studios located at NW College Spring Branch campus and will ensure that the recorded interviews meet appropriate standards of quality. The MOU has no expiry date, and is signed by Dr. Edmund “Butch” Herod, Acting President of HCC Northwest College and FIS Chairman, Krishna Vavilala. From left: Krishna Vavilala (FIS Chair. ), Dr. Edmund Butch Herod (HCC NW Acting President) on November 18. Thirty(30) interviews have been recorded so far,and the current MOU with HCC will certainly expedite the progress of the project. Interviews are done on first come first served basis. To schedule an interview and for further details, the number to call is :713-795-5169.